Down's insulating performance is incredible: good quality down is thought to be warmer for its weight than any fibrous synthetic insulation, more compressible, possessive of better compression recovery and a longer life-span. Its only major flaw is that its performance is marred when it is saturated with moisture. Goose down is usually superior to duck down (with the exception of eider duck down, which is extremely difficult to obtain). Down is a pure, natural, thermal-insulation product. It is grown by birds and in cold climates it enables them to survive severe weather conditions. The best down, therefore, is to be found on birds which spend winters in arctic or sub-arctic conditions. 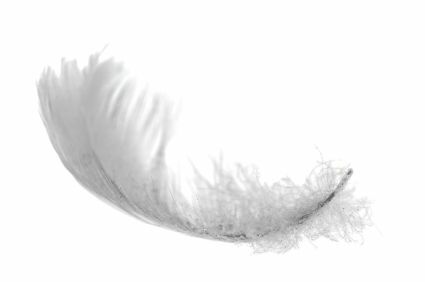 Down is unlike normal feathers in that it grows without a hard, central "stalk" or quill. In mature birds it forms a soft, fluffy underlayer close to the body beneath the bird's main feathers. The most common sources of down are ducks and geese. Down is used as an insulating material in various man-made products such as sleeping bags, insulated jackets, and bed coverings. In such applications the down insulation that is used is never 100% pure down but is a down mixture containing a small percentage of fine feathers also. This mixture is represented numerically as a ratio - for example 85:15, which means 85% pure down and 15% feathers. The greater the pure down % the better the insulation value, in theory, as long as you compare like-for-like qualities. In practice, above a 90:10 ratio it is quality differences which are of more significance in determining how good the insulation is. Quality is indicated by FILL POWER which is a measure of the down's ability to LOFT. Goose down is better than duck down, and Polish goose down is recognised world-wide as being of the highest quality. In particular it is beloved of the Japanese who are well known for demanding top quality and who buy large quantities of Polish down each year. The excellent quality of Polish down is partly due to climatic conditions, but is also the result of extensive academic research into breeding techniques, which are unsurpassed anywhere. The source of Polish goose down is the non-polluted region of forests, lakes and beautiful, natural landscapes of North-Eastern Poland. This is a particularly cold part of Poland, suffering long winter weeks of arctic air with temperatures reaching as low as -36°C in January 2003. It is to combat such severe conditions that the geese, whose natural habitat has been this region for thousands of years, have evolved their protective down to a quality which is unmatched anywhere, both for heat retention and for durability. LOFT is the ability of an insulation material to take in air and expand. It is the trapped air which is the actual insulator. The "insulating material" is merely the means for trapping the air and preventing air movement. The greater the amount of air trapped in the sleeping bag, the warmer is the sleeping bag because it retains more of your body heat. FILL POWER is a measure of the LOFT or expansion ability of down insulation. It denotes the volume (in cubic inches) to which 30 grams of down will expand when it takes in air. The greater the FILL POWER, the greater the expansion, the warmer the sleeping bag. FILL VOLUME is a measure of how much the TOTAL of all the down in a particular sleeping bag will expand. The greater the FILL VOLUME, the warmer the sleeping bag. For example, compare a sleeping bag filled with 900 gms of Chinese down, with one filled with 700 gms of Polish, diamond grade goose down. Lighter sleeping bag is actually warmer than the heavier one since it has a higher overall Fill Volume. When comparing the temperature or "season" ratings quoted by different manufacturers it is worthwhile doing the above type of calculation and comparing Fill Volumes. Down is prepared in a complex process involving washing, drying and sorting. In the course of this process washed using detergents and anti-allergens. The sterility is achieved by drying in temperatures up to 140°C. The aim of these procedures is to obtain a biologically neutral raw material of required character and the highest possible standard.